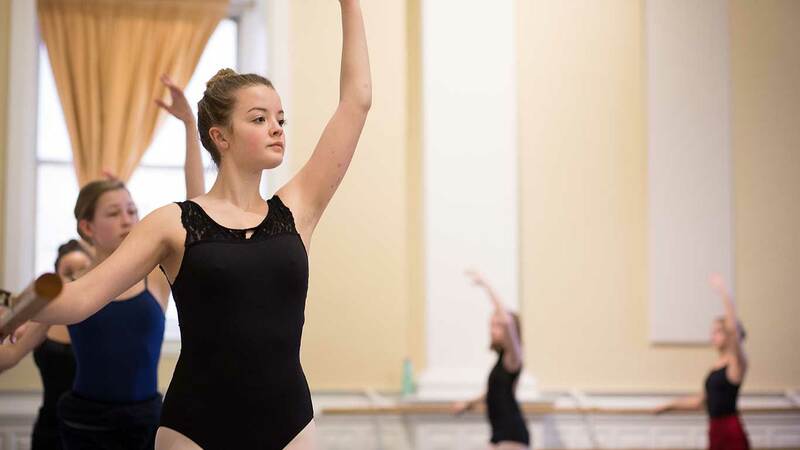 Our ballet dance program (Basics through Level VI) focuses on building strong classical technique that serves the student as they grow as dancers and helps them develop the necessary skills to meet the current demands of dance. The program includes classical ballet, contemporary ballet, pointe, choreography, floor barre, Pilates, and yoga. A strong work ethic and commitments are essential to success in ballet. We pay particular attention to the health and well-being of each individual student, striving for a safe and supportive environment where each student can learn and discover. Students begin dancing “en pointe” when the instructors feel they are physically strong enough and have a solid technical ability. Generally, not before Level IV. Plié, Relevé, Sauté! An introduction to ballet. Here is where we begin to develop ballet concepts including turn out, coordination, spatial awareness, and a specific focus on class etiquette. Students will begin positions of the feet, and introductory movement vocabulary.